Born 356 B.C. - Died 323 B.C. 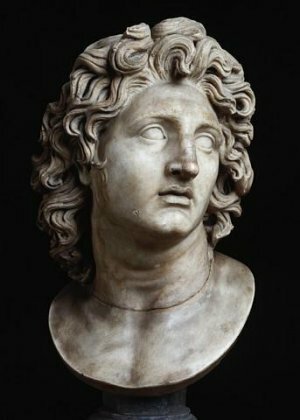 Alexander the Great was the son of a Macedonian general named Philip. His mother was Olympias. She told Alexander he was the son of a Greek god, and he seemed to think of himself as divine. He was a pupil of Aristotle , one of the foremost philosophers* of his time. He studied literature and learned to play the lyre. * He was fearless and strong as a young man. When he was 12 years old he saw a fine horse he wanted. No one had been able to ride the horse. He offered a wager to his father. If Alexander was able to ride the horse, his father would get it for him. If he failed, he would pay for the horse himself. He determined the horse was terrified of his shadow and that's why he wouldn't let anyone near. He turned the horse so he was facing the sun. In this way he could not see his shadow. He got on the horse and was able to ride him. His father bought the horse and Alexander named him Bucephalus (bue SEF uh lus). His father said to him, "You must find a kingdom worthy of you, my son. Macedon is too small for you." He later built a city and named it after his horse, the city of Bucephala. 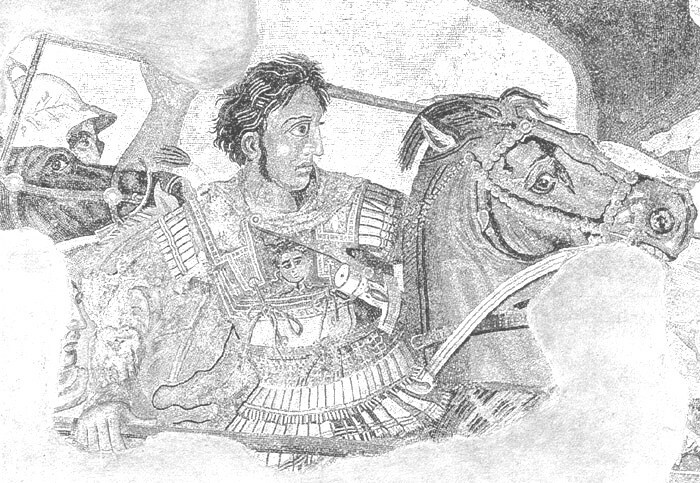 Alexander became one of the greatest generals in history. When he conquered the Persians he honored their soldiers and commander who had died in battle. When he had won a battle, he combined the remaining soldiers of the enemy with his army to form a greater army. He usually did not allow his soldiers to mistreat the conquered people. He suffered along with his soldiers when they were at war. If they didn't have water or food, he would not accept food or drink either. When the soldiers were walking, he walked also and refused to ride or be carried. He set an example for his troops. Once he was trying to capture a city which was on an island in the Mediterranean Sea. It was near the land, so he decided to build a bridge to it. His soldiers put down trees, reeds, and rocks and they began to build a peninsula* out to the island. The people of Tyre did everything they could to stop the soldiers, but in seven months Alexander's troops had built a bridge to the island and with the help of a naval fleet conquered the city. During his life he conquered the then-known world. He controlled Greece, captured Persia and Egypt and built a city in Egypt. He named it for himself, the city of Alexandria. He was the king of Macedonia and a pharoah in Egypt. Press "Go" to search for books about Alexander the Great. Uhm, I have a really major question and I need a reply but I was looking for what types of landforms the Empire had and I couldn't find any results online to help me with it! 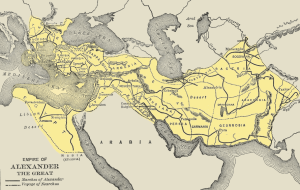 Are there even really landoforms in Alexander's Empire??? This page displayed 373,837 times.